I camped out on Inishark on Thursday night last. I had been out with a school trip on Inishbofin during the day and after finishing up with them I headed on over to Inishark/Inishshark. I wanted to get a better handle on some of the birdlife of this island which is a both a Special Area of Conservation and a Special Protection Area. My few previous trips to island were always rushed affairs with no time to properly examine breeding birds, so it was great to have the island to myself for 24 hours. My main focus were the cliff breeding species. I find this survey work to be both hard work but very rewarding. The three Bonxie pairs were again on the island although none had yet laid any eggs. It was nice to see one pair in the middle of displaying which involved the female bowing to and moving around the male with a lot of calling from each bird. A pair of Peregrines breed somewhere on the island and finding this pair was one of my main objectives for the trip. I had the adult male on three occasions including one where it was joined a second calendar male. The latter bird was giving begging calls and there was no aggression from the adult bird. 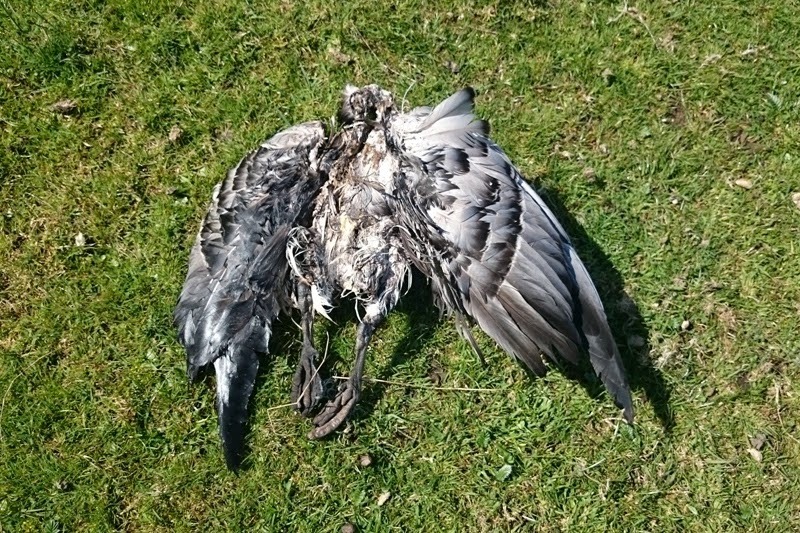 This was probably a juvenile bird from last season. Apparently it's not unknown for adult birds to feed their young a year after hatching even with new young in the nest! Given the extent and height of the cliffs it wasn't possible to confirm breeding on this occasion unfortunately but I have no doubt that the female was sat tight incubating eggs. 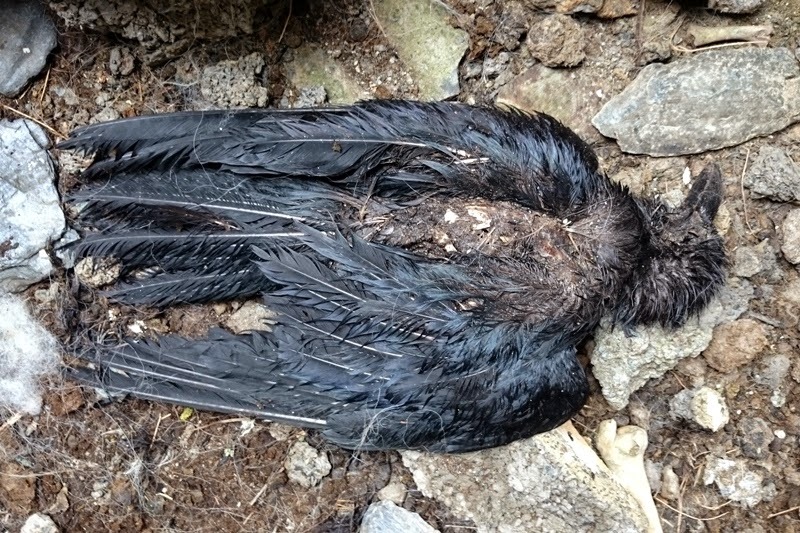 Despite wild and unfounded accusations by one regular visiting birder to Inishbofin, Ravens were not present in "unnaturally high" numbers on the island. There is only one pair on the entire island although I would have expected two pairs given the size of the island. Try as I might I just could not see the nest as it was at a spot that wasn't visible although the aggressive reception I got from the adults proved that they had chicks. This is a late enough clutch as most Raven chicks have now left the nest. I managed to find a new pair of Chough on the island also. The female was busy incubating. There was also a second pair breeding on the island but again I just couldn't pin them down. On the seabird side of things I counted approximately 430 apparent pairs of Fulmars, 93 Guillemots, 41 Kittiwakes, 13 Shag nests and 18 Black Guillemots (latter incomplete count). Great Black-backed Gulls were thinly spread out across the island with single figures of Herring and Lesser Black-backed Gulls breeding on one spot on the west cliffs. I heard a calling Manx Shearwater in the middle of the night and I'm sure that a few pairs breed on the island along with Storm Petrels. Ringed Plovers were the commonest breeding wader by far with probably a few dozen pairs on the island followed by Oystercatchers and a handful of Snipe in the wet spots. I heard no Corncrakes during my time on the island. There were 2 - 3 pairs here last summer. The nettle bed in which they hide are still very low which may explain their absence so far. We might be able to put some temporary fencing around some of the nettle beds give the Corncrake a better chance next season with the agreement of the landowners. I flushed a Tree Pipit just below the highest point on the island. It called once or twice but I never saw or heard it again. This is only the third one I've seen in the county (two others on Inishmore). The only other modern county record comes from Inishbofin. Other than a single Willow Warbler and a few Sand Martins and Whimbrels, those were all the migrants I had on the island. The only other breeding land birds seen were Rock Dove, Swallow, Wheatear, Meadow Pipit, Rock Pipit, Pied Wagtail, Stonechat, Skylark, Blackbird, Wren, Hooded Crow and Starling. While walking around the island I was again amazed at the numbers of fallen livestock on the island. Between ewes and lambs I must have come across 40 dead sheep on the island. 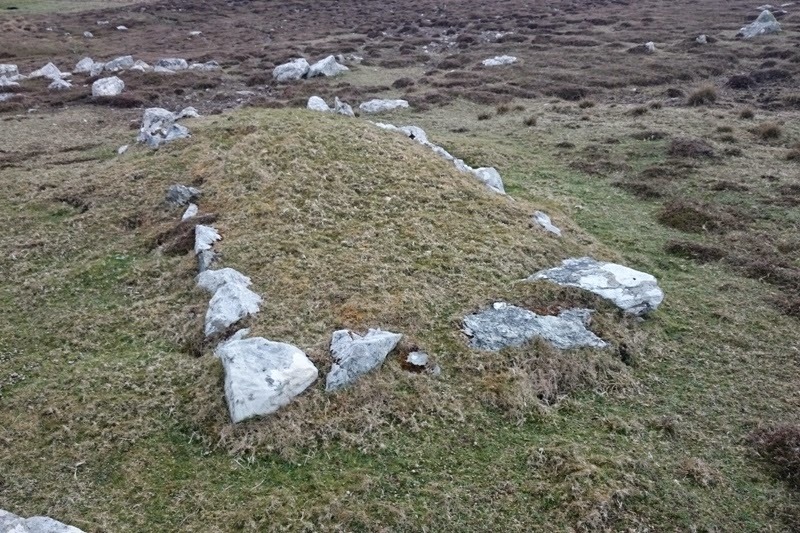 It was obvious that some had died while lambing, some had fallen off cliffs (I saw half a dozen live sheep trapped on cliffs and isolated coves) but I would imagine that most succumbed to the harsh winter conditions and lack of care. 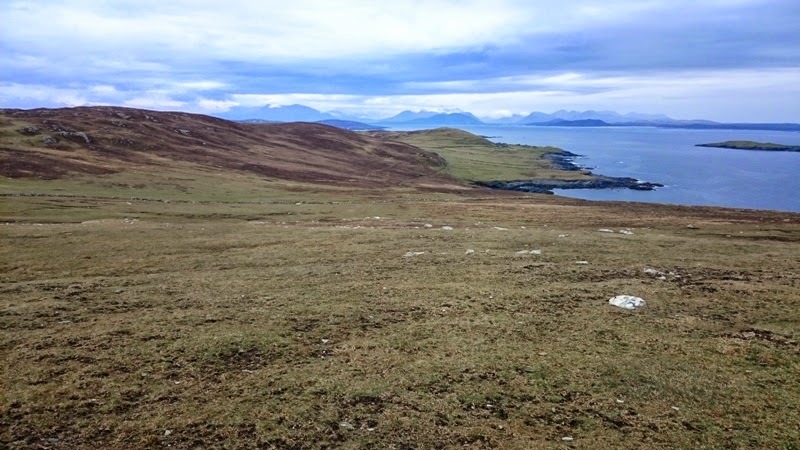 Sheep are left on the island over the winter in the full knowledge that it will not be possible to land on the island over the winter months due to very dicey landing conditions. You would have to wonder if its ethical to leave stock out in those conditions..
Bonxie with the mainland in the background. Hooded Crow sitting on the old church. Male Blackbird collecting food, only one pair on the entire island. 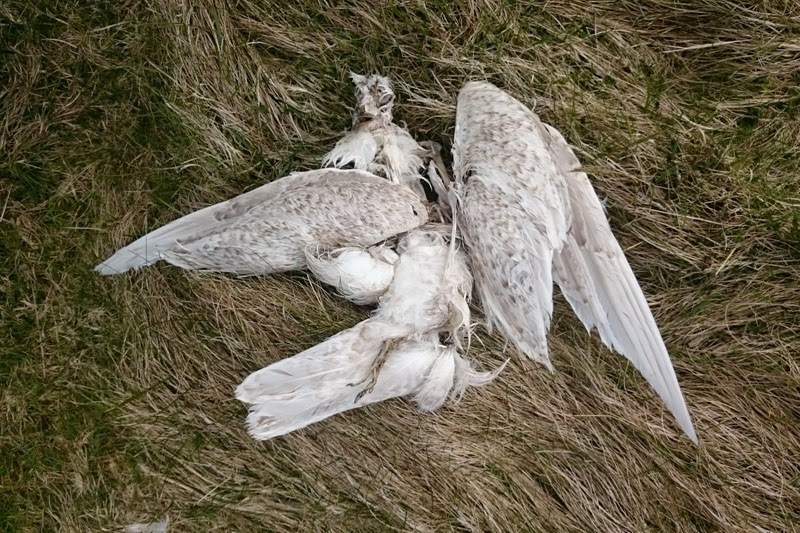 Dead first-winter Iceland Gull, Inishbofin. Dead Raven inside one of the abandoned houses. West end of Inishark looking back East.